Summertime school holidays call for keeping things cool and making it fun. There are plenty of interesting ways to do this in Brisbane these school holidays with special events hitting town or with the opportunity to revisit classic summertime family fun places. We've found our top five to share below. Remember the old slip 'n' slide that got a workout every summer? Well it's just been taken to a whole new level. Slideapalooza is coming to Sirromet Winery Mount Cotton for two terrific weekends of water sliding fun January 13 - 21. There will be sky high slides, single slides, slip 'n' slides and kids slides. Tickets start at $34 and can be booked online. If you'd prefer to stay dry these holidays there's no cooler place to visit than the Gallery of Modern Art. Current exhibitions perfect for the kids include Me, Myselfie & I, and Yayoi Kasuma: Life is the Heart of a Rainbow. Both are free and will provide hours of interactive fun for both big kids and small. 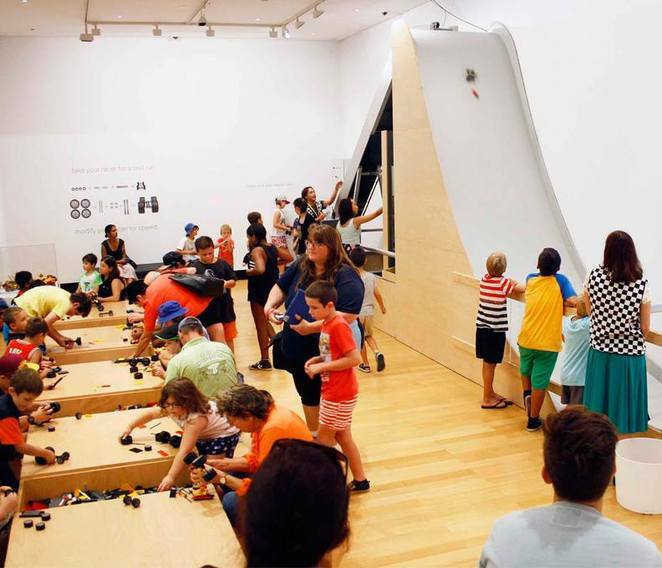 Little Lego fans can get building at the Ipswich Art Gallery over summer. Built for Speed lets kids construct their own vehicles to test their skills on the race ramps. All tickets are $5 and can be purchased at the gallery. The exhibition is open 10am – 5pm daily (closed Christmas Day, Boxing Day, New Year's Day). If you're looking for free outdoor fun you can't go past a visit to one of the many water play parks scattered across the south east. Try Settlement Cove at Redcliffe, Streets Beach at Southbank or Orion Lagoon at Springfield Central for a swim. The Gold Coast's top pick would have to be Broadwater Parklands, while the Sunshine Coast has the water play area and Sir Francis Nicklin Memorial Pool at Kings Beach. Just remember to slip, slop & slap! From December 18 through to January 21 the State Library of Queensland will be hosting their annual summer school holiday program jam packed with free and ticketed events for babies, toddlers, kids, tweens and teens. Story Lab workshops will return with a focus on digital and design technologies where kids can explore creative and critical thinking. The Knowledge Walk will once again be a hive of activity, The Corner will be a colourful kaleidoscope of fun, and Digital Futures Lab in the level two Gallery to set for interactive learning disguised as fun. Many of the ticketed sessions fill up fast so be sure to view the program online. So if you're hanging around town these school holidays you've now got a few more ideas to get you started on planning your very own summery family adventure. We know there's even more excitement to be had – we'd love to hear about your summer school holiday ideas by sharing in the comment field below. Why? Make some cool summer school holiday family memories. Thanks for the ideas Katie.